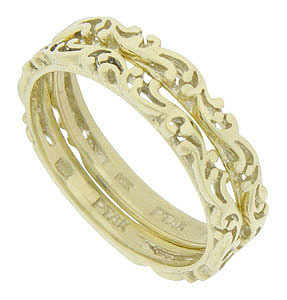 These 14K green gold stackable wedding bands feature a flowing design done in relief. The wedding rings measure 2.16 mm in width. Photographed with WB2365 (sold separately). Size: 6 1/4. We can re-size or reorder in other sizes. 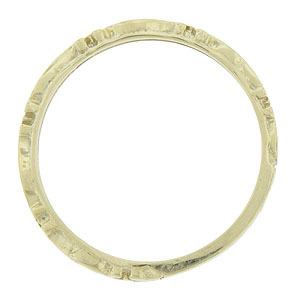 Also available in 18K, white and yellow gold, pink gold and platinum. Contact us for current market cost. The bands are frequently purchased as a set for $500.00 but they are also available individually.